Britain's most unlikely sporting hero Eddie 'The Eagle' Edwards has now become the unlikely subject of a rousing, feel-good biopic starring Kingsman actor Taron Egerton and X-Men's Hugh Jackman. A fictionalised account of the hapless British ski-jumper, a sportsman so bad that he unexpectedly became a minor celebrity, the movie rewinds from the 1988 Calgary Winter Olympics (where Edwards has become the first British person to ever take part) to the title character's childhood, where his underdog determination to succeed is first established. 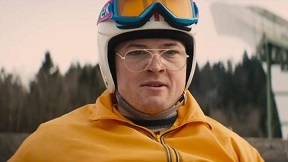 Egerton plays the older Eddie as he attempts to make in-roads into ski jumping, eventually teaming with Jackman's gruff (and fictional) trainer Bronson Peary to realise his dream. Fluffy and inconsequential though the movie is, Egerton and Jackman make a charming pairing under the reliable directorial hand of Wild Bill filmmaker Dexter Fletcher. The movie also allows Kingsman composer Matthew Margeson to let rip with a retro corker of a score, a delightful throwback to a particular era of film music history that expertly skirts the divide between the cheesy and the nostalgic. Ironically enough, by drawing on an oft-derided period of film scores Margeson has come up with one of the most purely enjoyable soundtracks in years; in interviews, he has explained how the tone of the score was inevitably dictated by the movie's eighties setting, and the end result is superb, mixing electronic and orchestral methods brilliantly. With overtones of early period Hans Zimmer, plus a soupcon of Vangelis, the score kicks off with "Champion": a rousing horn melody emerges from a wash of synths to establish the texture and tone of the score as a whole. 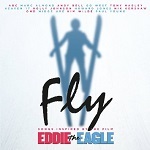 The lengthier "Eddie the Eagle" main theme is where the Zimmer and Vangelis comparisons really raise their head, electronics pulsating and twinkling beneath a lovely piano undercurrent; the expert fusion of certain live instruments with the synthetics also calls to mind the master of such things, Jerry Goldsmith. The power anthem explosion two and half minutes into the track, complete with drum machines, is cheesy yet engaging thanks to Margeson's genuinely appealing constructs. He's also able to keep the tone of the score varied and dynamic. The wistful bars of the main theme in "What Goes Up Must Come Down" resonate with a sense of hope, an unattainable goal lying just out of reach, whilst "I'm Going to the Olympics" begins with hesitant piano before the upbeat synths take over to give an appropriately optimistic feel. The tone of the electronics changes again in "Matti at Garmisch", more purposeful and heroic; those with a fond memory of early console game scores will find a lot to enjoy. "Warren Sharp" calms everything down again with a lovely woodwind section before Margeson swings it back to the Rain Man/Driving Miss Daisy-esque textures in "Eddie Gets a Taste". "Up Forward Back Down" and "The Teaching Text" are two of the score's quietest and most pensive cues, reinforcing the massive hurdle that Eddie looks to cross with the piano once again present as a humanising element. Both "Eddie Attempts the 70m" and "Seniors Tournament" build from quiet beginnings to some of the score's more tense moments, growling textures resonating with the air of disaster as Eddie comes up against the force of the ski-jumping establishment. However, given the overall trajectory of the soundtrack, these gloomy moments are relatively infrequent: it's soon back to unashamed triumph in the electric guitar-laden "Fist of Glory", whose track title is wonderfully evocative of what listeners are likely to do upon hearing it. The exciting "Oberstdorf" carries overtones of Zimmer's early TV work like "Going for Gold", edging just along the line between irony and genuine entertainment, although it calms down for a moment of tender reflection in the second half. After a period-authentic interlude in the form of song "A Sporting Chance" by Jason Soudah, it's back to Margeson's score in "First Jump at Calgary" with its terrific, processed brass fanfare heralding some of the music's most forthright electronics. "Press Montage" meanwhile is utterly retro, an infectious blast of 80s style so helplessly old-school that one can't help but go along with it. Contrasted with this is the plaintive "Eddie's Announcement" that takes the synth theme and initially dials it back to a somewhat sadder register, before steadily building into a spine-tingling climax. The four-track finale is where Margeson brings all his musical textures and thematic ideas together, electronics, woodwind and piano. Beginning with the hopeful "Peary's Return", in which the brass fanfare mixes with noble strings, there's a brief action interlude in "Matti's Gold Jump" before the terrific two- hander of "Eddie Jumps the 90m" and "Now the Real Work Begins" brings everything to a spectacular close. 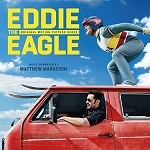 With their surging synth figures, orchestral inflections and general sense of fun, there's no doubt these two pieces will go down as two of the year's most entertaining; it's the perfect musical summation of the real-life Eddie the Eagle's unassailable spirit. There's no denying Eddie the Eagle as a score could have gone badly wrong, relying too much on a listener's nostalgia for its impact. Thankfully, Margeson has crafted a score that mixes knowing self-awareness with a genuine sense of heart: this is music that openly acknowledges its somewhat dated influences and yet makes them feel fresh and exciting again. It's a score with a foot in the past that stems very much from a 21st century mindset, cheekily acknowledging the overblown stylistics of 80s film music whilst fusing them with a contemporary sense of dramatic intuition. And by mediating the synth onslaught with just enough orchestral textures, Margeson prevents the score from becoming samey, utilising a dynamic mixture of live and processed sounds to keep things moving. It's a rip-roaring charmer guaranteed to put a smile on one's face. The album is available for download and on CD at these links: Amazon.com or Amazon.co.uk.